Senior Editors: Mark Bechtel, Trisha Lucey Blackmar, MJ Day (Swimsuit); Mark Godich; Stefanie Kaufman (Operations); Kostya P.
The goal of the new magazine was to be basically a magazine, but with sports. Many at Time-Life scoffed at Luce's idea; in his Pulitzer Prize–winning biography, Luce and His Empire, W. A. Swanberg wrote that the company's intellectuals dubbed the proposed magazine "Muscle", "Jockstrap", and "Sweat Socks". Launched on August 16, 1954, it was not profitable (and would not be so for 12 years) and not particularly well run at first, but Luce's timing was good. The popularity of spectator sports in the United States was about to explode, and that popularity came to be driven largely by three things: economic prosperity, television, and Sports Illustrated. The early issues of the magazine seemed caught between two opposing views of its audience. Much of the subject matter was directed at upper-class activities such as yachting, polo and safaris, but upscale would-be advertisers were unconvinced that sports fans were a significant part of their market. After more than a decade of steady losses, the magazine's fortunes finally turned around in the 1960s when Andre Laguerre became its managing editor. A European correspondent for Time, Inc., who later became chief of the Time-Life news bureaux in Paris and London (for a time he ran both simultaneously), Laguerre attracted Henry Luce's attention in 1956 with his singular coverage of the Winter Olympic Games in Cortina d'Ampezzo, Italy, which became the core of SI's coverage of those games. In May 1956, Luce brought Laguerre to New York to become assistant managing editor of the magazine. He was named managing editor in 1960, and he more than doubled the circulation by instituting a system of departmental editors, redesigning the internal format, and inaugurating the unprecedented use in a news magazine of full-color photographic coverage of the week's sports events. He was also one of the first to sense the rise of national interest in professional football. Laguerre also instituted the innovative concept of one long story at the end of every issue, which he called the "bonus piece". These well-written, in-depth articles helped to distinguish Sports Illustrated from other sports publications, and helped launch the careers of such legendary writers as Frank Deford, who in March 2010 wrote of Laguerre, "He smoked cigars and drank Scotch and made the sun move across the heavens ... His genius as an editor was that he made you want to please him, but he wanted you to do that by writing in your own distinct way." Laguerre is also credited with the conception and creation of the annual Swimsuit Issue, which quickly became, and remains, the most popular issue each year. In 1990, Time Inc. merged with Warner Communications to form the media conglomerate Time Warner. In 2014, Time Inc. was spun off from Time Warner. In November 2017, Meredith Corporation announced that it would acquire Time Inc., and the acquisition was completed in January 2018. However, in March 2018, Meredith stated that it would explore selling Sports Illustrated and several other former Time properties, arguing that they did not properly align with the company's lifestyle brands and publications. In-depth sports reporting from writers like Robert Creamer, Tex Maule and Dan Jenkins. Regular illustration features by artists like Robert Riger. High school football Player of the Month awards. 1994 Launched Sports Illustrated Interactive CD-ROM with StarPress Multimedia, Incorporates player stats, video and highlights from the year in sports. In 2015 Sports Illustrated purchased a group of software companies and combined them to create Sports Illustrated Play, a platform that offers sports league management software as a service. In 1965, offset printing began to allow the color pages of the magazine to be printed overnight, not only producing crisper and brighter images, but also finally enabling the editors to merge the best color with the latest news. By 1967, the magazine was printing 200 pages of "fast color" a year; in 1983, SI became the first American full-color newsweekly. An intense rivalry developed between photographers, particularly Walter Iooss and Neil Leifer, to get a decisive cover shot that would be on newsstands and in mailboxes only a few days later. In the late 1970s and early 1980s, during Gil Rogin's term as Managing Editor, the feature stories of Frank Deford became the magazine's anchor. "Bonus pieces" on Pete Rozelle, Woody Hayes, Bear Bryant, Howard Cosell and others became some of the most quoted sources about these figures, and Deford established a reputation as one of the best writers of the time. Who's Hot, Who's Not: A feature on who's on a tear and who's in a slump. Inside the NFL, MLB, NHL, NBA, College Football, College Basketball, NASCAR, Golf, Boxing, Horse Racing, Soccer and Tennis (sports vary from issue to issue) has the writers from each sport to address the latest news and rumors in their respective fields. Faces in the Crowd: honors talented amateur athletes and their accomplishments. The Point After: A back-page column featuring a rotation of SI writers as well as other contributors. Content varies from compelling stories to challenging opinion, focusing on both the world of sports and the role sports play in society. Maya Moore of the WNBA's Minnesota Lynx was the inaugural winner of the Sports Illustrated Performer of the Year Award in 2017. Since 1954, Sports Illustrated magazine has annually presented the Sportsperson of the Year award to "the athlete or team whose performance that year most embodies the spirit of sportsmanship and achievement." Roger Bannister won the first-ever Sportsman of the Year award thanks to his record-breaking time of 3:59.4 for a mile (the first-ever time a mile had been run under four minutes). Both men and women have won the award, originally called "Sportsman of the Year" and renamed "Sportswoman of the Year" or "Sportswomen of the Year" when applicable; it is currently known as "Sportsperson of the Year." The 2017 winners of the award are Houston Texans defensive end, J. J. Watt, and Houston Astros second baseman, José Altuve. Both athletes were recognized for their efforts in helping rebuild the city of Houston following Hurricane Harvey in addition to Altuve being a part of the Astros team that won the franchise's first World Series in 2017. The 2018 winners were the Golden State Warriors as a team for winning their third NBA Title in four years. 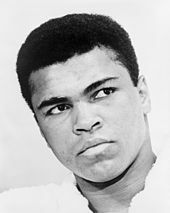 In 1999, Sports Illustrated named Muhammad Ali the Sportsman of the Century at the Sports Illustrated's 20th Century Sports Awards in New York City's Madison Square Garden. In 2015, the magazine renamed its Sportsman Legacy Award to the Sports Illustrated's Muhammad Ali Legacy Award. The annual award was originally created in 2008 and honors former "sports figures who embody the ideals of sportsmanship, leadership and philanthropy as vehicles for changing the world." Ali first appeared on the magazine's cover in 1963 and went on to be featured on numerous covers during his storied career. His widow, Lonnie Ali, is consulted when choosing a recipient. In 2017, football quarterback Colin Kaepernick was honored with the Award, which was presented by Beyoncé. The following list contains the athletes with most covers. 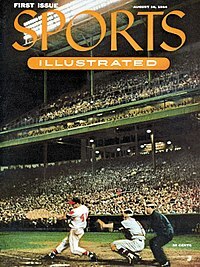 The magazine's cover is the basis of a sports myth known as the Sports Illustrated Cover Jinx. Dale Earnhardt Dale Earnhardt, Jr.
John F. Kennedy December 26, 1960 First Lady Jackie Kennedy also on cover and Kennedy was President-Elect at the time of the cover. Gerald Ford July 8, 1974 Cover came one month before President Richard Nixon announced he would resign from the Presidency. Dale Earnhardt February 26, 2001 Died in a crash on the last lap of the 2001 Daytona 500. Pat Tillman May 3, 2004 Arizona Cardinals player turned U.S. soldier who was killed in a friendly fire incident in Afghanistan. Ed Thomas July 6, 2009 Parkersburg, Iowa high school football coach that was gunned down by one of his former players on the morning of June 24, 2009. John Wooden June 14, 2010 UCLA Basketball coaching legend who died of natural causes at 99 years of age. Was created and published in Canada with US content from 1993 to 1995. Most of the issues appear to have the same cover except they say 'Canadian Edition'. These issues are numbered differently in the listing. A group of the Canadian issues have unique Canadian athletes (hockey mostly) and all the Canadian issues may have some different article content. The advertising may also be Canada-centric. This is their tribute and special edition issues that are sold both nationally or regionally as stand alone products. **Originally started with Super Bowl Tributes the product became a mainstay in 1993 with Alabama as the NCAA National Football Champions. Today multiple issues are released including regional releases of the NCAA, NBA, NFL, MLB champions along with special events or special people. Advertising deals are also done with Sports Illustrated Presents (Kelloggs). Dedicated to college athletics and the sports interests of college students. Distributed free on 72 college campuses through a network of college newspapers. Circulation of one million readers between the ages of 18 and 24. ^ "New Sports Illustrated Photography Director: Brad Smith". nppa.org. February 28, 2013. Archived from the original on June 20, 2017. Retrieved April 26, 2018. ^ "Consumer Magazines". Alliance for Audited Media. Archived from the original on April 18, 2014. Retrieved February 10, 2014. ^ Plunkett, Jack W. (2006). Plunkett's Sports Industry Almanac 2007. Plunkett Research, Ltd. ISBN 1593924151. ^ French, Alex (August 9, 2013). "The Very First Issues of 19 Famous Magazines". Mental Floss. London, England: Dennis Publishing. Archived from the original on August 10, 2013. Retrieved August 10, 2015. ^ (MacCambridge 1997, pp. 17–25). ^ "Henry Luce and Time-Life's America: A Vision of Empire". American Masters, April 28, 2004. ^ MacCambridge, Michael (1998). The Franchise: A History of Sports Illustrated Magazine. Hyperion. ISBN 9780786883578. Archived from the original on February 2, 2017. ^ (MacCambridge 1997, pp. 6, 27, 42). ^ "Designer Swimwear". Archived from the original on February 14, 2015. ^ Sutton, Kelso F. (January 29, 1979). "Letter From The Publisher". Sports Illustrated. Archived from the original on May 11, 2011. ^ Deford, Frank: "Sometimes the Bear Eats You: Confessions of a Sportswriter". Sports Illustrated, March 29, 2010 pp. 52–62. ^ Gold, Brian Stelter and Hadas Gold. "Meredith is putting Sports Illustrated and Time magazines on the block". CNNMoney. Archived from the original on March 29, 2018. Retrieved March 29, 2018. ^ (MacCambridge 1997, pp. 236–238). ^ Kolur, Nihal (November 29, 2017). "Minnesota Lynx Star Maya Moore Wins Sports Illustrated's Performer of the Year Award". Time Inc. Sports Illustrated. Archived from the original on November 30, 2017. Retrieved December 1, 2017. ^ a b "Sportsmen of the Year 1954–2008". Sports Illustrated. December 8, 2008. Archived from the original on March 12, 2017. Retrieved June 9, 2017. ^ Brinson, Will (December 15, 2013). "'Sports Illustrated' names Peyton Manning its Sportsman of the Year". CBS Sports. Archived from the original on November 7, 2017. Retrieved June 9, 2017. ^ Holland, Gerald (January 3, 1955). "1954 & Its Sportsman: Roger Bannister". Sports Illustrated. Archived from the original on November 7, 2017. Retrieved June 9, 2017. ^ "SI's 2017 Sportsperson of the Year: J.J. Watt, José Altuve". SI.com. Archived from the original on March 22, 2018. Retrieved March 21, 2018. ^ "How the Astros stuck together to become World Series champions". SI.com. Archived from the original on March 21, 2018. Retrieved March 21, 2018. ^ "Sports Illustrated honors world's greatest athletes". CNN. December 3, 1999. Archived from the original on August 19, 2011. ^ Rosenberg, Michael Sports illustrated, November 30, 2017. Retrieved September 13, 2018. ^ Kelly, Greg. Sports Illustrated: The Covers. New York: Sports Illustrated Books, 2010. Print. ^ "America's Best Sports Colleges". Sports Illustrated. October 7, 2002. Archived from the original on January 1, 2006. Retrieved February 10, 2012. ^ "Registered & Protected by MarkMonitor". vault.sportsillustrated.cnn.com. Archived from the original on June 27, 2009. Retrieved April 26, 2018. ^ Robert Smithies, "Through a lens lightly Archived 2016-03-13 at the Wayback Machine" (obituary of Finlayson), The Guardian, February 27, 1999. Accessed February 16, 2013. ^ Search results for Finlayson, Sports Illustrated archive. Accessed February 17, 2013. ^ Silver, Elliot. "CNNSi.com Sells for $5,500". DomainInvesting.com. DomainInvesting.com. Archived from the original on April 2, 2016. Retrieved April 4, 2016. MacCambridge, Michael (1997), The Franchise: A History of Sports Illustrated Magazine, Hyperion Press, ISBN 0-7868-6216-5 . Fleder, Rob (2005), Sports Illustrated 50: The Anniversary Book, Time Inc., ISBN 1-932273-49-2 . Regli, Philip (1998), The Collectors Guide to Sports Illustrated and Sports Publications, Beckett, ISBN 1-887432-49-3 . McEntegart, Pete; Wertheim, L. Jon; Menez, Gene; Bechtel, Mark (December 16, 2002). "SI's "The Top 100 Sports Books of All Time"". CNN/Sports Illustrated. Retrieved February 11, 2011. Wikimedia Commons has media related to Sports Illustrated.